My biggest fear as race day approaches is that my longest training run has only been 10-miles. 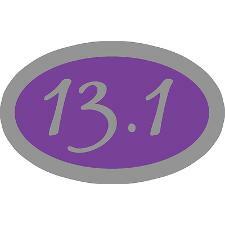 The race is 13.1. Do I run the last 3.1 miles on a wing and a prayer, or hope the adrenalin generated by the race kicks in and carries me along? That happened in the Turkey Trot 10K (my first and only), and I finished in 1:16:16. I’m not sure how to equate that to my situation when I’m running at almost a walkable pace. How much slower can I go? Ah, there’s the answer. Slow down to a walk. The encouraging thing, based on his analysis, is that I should get to the finish line without ever having run/walked 13.1 miles before. Currently, I am at the 7-mile point with my second book The Last MacKlenna. While I’m not a newbie writer, this contemporary story is a different genre for me. It is also a very personal story and is emotionally challenging. I’ve slowed my pace to a walk, and I’m stumbling toward the finish line. Without the training provided by writing The Ruby Brooch, I would never have gotten 100,000 words into this story, and it’s that training that will see me to the end. In a way, I think writing will always be like that with each book providing the training to get me through the next one—each one a different race with different terrain and different weather.